I'm cramming for Comic-Con, plus it's already late, so I'm not going to spend a lot of time reviewing Transformers here. Basically, it's a fun film that is sometimes silly, with good special effects and action, and a some decent one-liners and nods to the franchise's history. Some of the attempted humor is clunky, and a lot of the fight scenes are blurry and chaotic, but the character designs, which were controversial among many fans, work excellently in the context of the film, and we are left wide open for a sequel. Verdict: Awesome. Well worth full ticket prices to see robots gettin' blowed up good. You will leave the theater feeling like someone grabbed you and shook you by the shoulders for two-plus hours... in a good way! 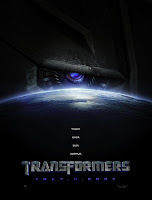 As you all may or may not know, the live action Transformers movie is debuting on the fourth of July, 7-4-7, as the posters say. Only it isn't, because they moved it up a day, so 7-3-7, as the new posters say. But then they decided to move it up another day with advance screenings starting at 8:00pm, so now it's premiering on 7-2-7, which is not on any poster that I have seen. Basically, Transformers will be opening on a Monday, giving it a SEVEN day Fourth of July 'weekend' opening. You are asking yourself a question right now, and the answer is, "yes, Hollywood is ridiculous." I have my ticket, and I will be there, rain or shine, alone if need be--as track four of the soundtrack to the original Transformers movie says, NOTHING'S GONNA STAND IN MY WAY. I will not be buying tickets or saving seats for anyone, but I would be delighted if you would meet me there. If you decide to come, I highly recommend buying tickets online. And since I'm not doing anything other than writing this email, feel free to bring as many people as you like. Like Optimus Prime recruiting soldiers for the Ark's fateful journey to planet Earth, I will only be taking volunteers for this mission. Let no one feel obligated to fight for the freedom of all sentient beings. But with any luck, we might see some cool special effects and watch some robots get blowed up good. So--if you decide to attend, just meet me inside. You will know me by the geeky child-like grin on my face. ** Actually, I'm being a jerk about Pearl Harbor (the movie), I haven't seen it, though I understand that it is terrible. also, did u forget Gigantor? or do u not like him? transformers was amazing man. its what i've been waiting my entire life for.. ever since i turned ages 10+. and i was blown away. charles-- i dig gigantor--he's just not one of my super-favorites. the robot anime that i listed are ones that i'm pretty crazy about. dustin-- *high five* i can't wait to get the dvd so that i can watch the fight scenes in slow-mo!